Sophie at 6 months. Though not as water oriented as her Lab roommate, Sophie enjoys the ocean > © photo by Desiree. Allex Michael: However, you may get an extra year or two of working life out of a ridgeback as they have fewer health problems and seem to live a bit longer than other large dog breeds. 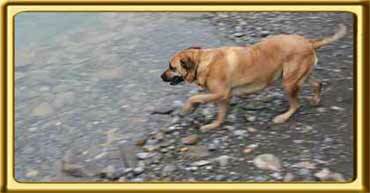 Like one 110 pound (50kg) male who passed at 16 years of age and have heard of several other longer lived ridgebacks. Out of the 133 breeds evaluated, Dr. Stanley Coren's book on dog intelligence rates the following breeds for working and obedience intelligence (aptitude). 1-10 is brightest, 27-39 above average, 40-54 average, 55-69 fair. Staffordshire Terrier (34), German Shepherd Dog (3), Rhodesian Ridgeback (52), Rottweiler (9) Please note 'obedience intelligence' refers to a dog's aptitude for obedience and not their intellectual ability. Ridgebacks would likely rate quite high in intelligence. 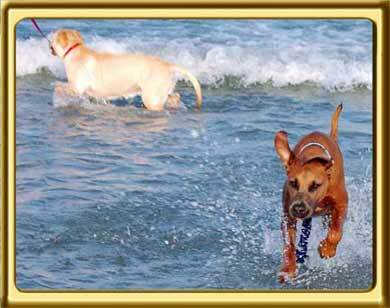 Please also note all the above 4 breeds including ridgebacks are ranked in the top 15 most effective guard dogs. When it comes to aggression, guard dogs need the most training for obvious reasons and the higher the working and obedience intelligence the better of course. So ridgebacks are only fair to average in this category ie: less controllable in a tense situation and must have adequate training. < Initially terrified of water, it took months before Ebbey would get her tummy wet. The canine actor costars in the new film SEARCH DOG'S RAVEN: the Eerie Story of a Search Dog Team. Obviously, if you trained a pit bull you're a very good trainer and or a good trainer with an exceptional pit bull. A ridgeback is stereotypically more difficult to train than a pit bull, so that is something to keep in mind. Bloodhounds are also not exceptionally trainable, but amazing trackers. But, unlike most search dogs, they are generally used exclusively on leash. Aggression: Ebbey the canine actor is not human aggressive, (wags her tail when strangers knock on the door) though when someone tried to break in the door, she showed aggression. She is also wary of mentally unstable people. Ridgebacks are notoriously brave (bred to hunt lions) and fearless when protecting their owner.